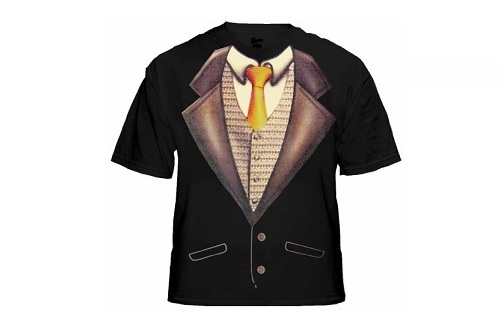 The Men's Deluxe Tuxedo T-Shirt With Gold Tie is printed on a deluxe 100% pre-shrunk cotton tee that is soft and breathable for all day comfort. All of our tuxedo t-shirts are the casual way to be formal and are great for weddings, proms, parties, concerts or anywhere you want to kick back, relax and look cool. This shirt has been printed using an exclusive printing process which adds a soft look and appearance to the ink on the shirt, making the design appear as if it is really fabric from a distance.